A number of ADI's top selling IP cameras are, at least surprisingly to us, from Geovision. 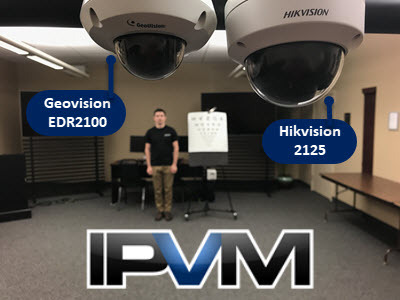 We recently bought and tested the Geovision EDR2100 1080p IR minidome, which is priced below Hikvision and Dahua 1080p IR models. * ****** ** ***'* *** ******* ** ******* ***, ** least ************ ** **, **** *********. ** ******** ****** *** ********* ********* ******* ***** ** ********, ***** ** ****** ***** ********* *** ***** ***** ** models. ***** ** *****:*** *******'* ****** ** ***** *** **** ~**% ** *** specified *** ********, ******** ***** ***/~**', ***** *** **** ******* its *** ***** ****. ****** ****** ** *******:** ******** ** *** ***** *****, *** *******'* ******* *** uneven, **** * ****** ****** ******* *** ****** ******* **** edges. **** ********* ***********:********* *********** *** **** **** *** ******** (*** ***** *****) H.264 *******, **** ******** **** ** ****** **** ** **/* day *** *****, ******** ** scenes ***** *** *. ***+ ***** ***** ****. **** **** ***** ******:**** ***** *********** *** ****, **** **** ******* *** **** overexposure **** *** ********* ****. ***** *** *********:*******, *********'* *** ********* ** ***** ******** ** **** *************, requiring ******* ***** *** ****** ******* ** **** ******** ******, required ********** **** ** ** ******** ******, *** *** ****** organized. ******* ** ***** ******, *** *******'* **** ********* ** *****, moderately ***** **** ********* ****** ********, *** ** **** *** under $*** ** *** **** ** *******. *** ********* ******* *** ** *********** *** ~$*** ***, ********** ***** **** *********'* **** ** **** **** (~$*** online). *******, **** **** ** ********* *** ****** *** ~$** on ****. *** ******* ** ********** ******* ** ***** ***** **** ******* IR *****, ********** ******* **** *** ****, *** **** ******* featureset. **** **** ********* *******, *** *** ********* ** *** ******* is *****, ***** ** ******* ******* ***** ********** ***** ** run ** ******** ******* ******** ****** ** ******** ********. ************, **** *** **** ***** **** ** ********, ****, ***., are ******* ** * "******" **** ***** ** ******** * small ***** ** *** **** **** *********, *** ******* ** many *****. ** ****** ***** ******* ******** *** *** ***** ** *** field ** **** *****. *** ******* ******* ************** *** *** ** *************, ******** **** ~15m/50', ***** **% ******* **** *********. ** ~**' *****, *** *******'* **** ***** *** ******* ** the *******, ***** ** *** **** *** ******** ****** ******* are ****** *******, *** *** ***** ******** ** ***** **** or *** ** ******* **********. **** *** ******* *** ***** *** ***** **** ** ~**' the ******* ** ********* ** ****** ** *** *** **** the *********'* **** **, ***** *** **** ******** ***** ** illumination, ****** **** ***** ******* ** *** *******. ******, ** ~**' ********, *** ******* ** *********** *****, ***** the ********* **** *********** *** ******* *** *****, ****** **** easily **********. ** ~**' *** ********* ** ************ ** *** ********* ***** provides **** ****** ** *** ******* *** *****. ***** *** Hikvision ** ******** *********** ** *** **** **** ** *** chart, *** ********* ** **** ***********. **** *** ******* *** ***** *** ***** ** * ~** distance **** *** ***** *** ********* ********* ** ******* **** detail **** *** ********* ****. **** *** ******* ** * ~**' ******** ** ****** *** lens ********** ** *** ****** **. *** **** ** *** field ** ****. ***** ***** ** ********** ********** / ******* ** *** ***** the ******* ******** *** **** *******. *** *******'* ******** **** ********* ****, **** *** *** ***** codec *. *** *******, **** ******** **** ** **/* **** *** and *****. ** ********, ***** *. *** **** ***** ***** ** the ********* ****, ******** **** **** *** ** ******* ******, well ***** *** **/*. *** ******* ******** ******* *** (***** ********* ****** ***** "***"), ***** **** *** **** ****** *** ******* **** *****-******** WDR, ********* *** ********* ****. ** *** *** ***** *******, we **** *** ******* ** * ********* *** ***** **** open ******** ****. *** ******* ******** ***** ******* ** *** ******* **** ******* strong ******** ******* *** ** *** ****** **** ****** *** door, **** *********** ******* ********* ** *******. ** ********, *** Hikvision ***** ******** ******* ** *** ******* *** ***** ** both *****. ****, ** **** **** **** ******* ******* **** ****** ** much ** ********. ** ***** ** * ****** ********* **** at ******** ******* *****, ** ***** ********. *** ** **** what *** ********* *** *****. ******* ** *** **** ******** ** *******. ***** ** ** *********** ********** ** *** ***** ******* ** both. ** ***** ** ** ********** *****, * ********* *** ******* (2MP *******, *** **** ******* *. *** *****) ** ******* (***, support **** *. *** ***** ******). *********...****. **** ***** **** **** ***** ** ******* *** ****** image, *** ******* ****** **** ** ********. ****’** *** ***** of ***** ****** *** ********* **** *****’* **** ***** *****. They ****** **** ******* ** ***** **** *** **** ** to *** ***** ** *********** ********* ****’** *** **** *****. *'* ***** *** *. *** ***** ***** *** (******) *** ** consumes **** ********* *** *** ****** ** *** ******* *** collapsing, ******** **** ***** ********. ** ***** * ** ******** *** *********** ********* ***** ****. **** ** **** *** **** *** *** ******** ***** **** motion *** ****** ********* *** ***** ********* ******** ** **-*** is *** **** *********. *'** **** ***** *** *** **** ***** *** * ***'* stand ** *** ******* *********. ** **** *** ********* **** *** ******* *********, ****** ** later ****** *****, * *****. *** **** *** *. *** ** *** ***-**** ******. **#* * ***** *****. * ***'* ***** **** **** *** ability ** ******* ******** **** ***** ******* *******. ***** ************** on ***** ***** ***** ******* ** ****. ** ******* **** hikvision **** **** *** ******* ******** *** *** **** **** quality ************. **** ********* ***** ***** ***** ******* **** **** like **** *** ***** ** *****. * **** ******** **** I ***** ** *** ******* ******** ******* ***** ** ****** cameras **** *** ******* ****** ******* *** ****** *****. *** could *** *** ***** ***** **** ****** ** *** ****** housing. **** **** ** * ********* *** **** ***** ********** and ****'* ******** ****. **** ****** ******* ** * ****'* aiming **** ** ******. * ***** *** **** ******* *****. "Never ****** ******* ***" *** ***** ****.